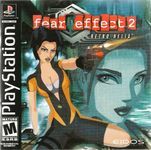 Fear Effect 2: Retro Helix is a 2001 video game for the PlayStation. It was developed by Kronos Digital Entertainment and published by Eidos Interactive. Fear Effect 2 is a prequel chronicling the events that lead up to the original Fear Effect. Retro Helix begins in Hong Kong in the year 2048. The player delves into the colorful histories of the original cast of three mercenaries - and newcomer Rain Qin - as well as the extraordinary circumstances that brought them together. In the wake of a degenerative global pandemic called EINDS (Environmentally Induced Nucleotides Degeneration Syndrome – pronounced "ends"), theft, murder, and terrorism have become big business. Fear Effect: 2 Retro Helix features cel-shaded character models in pre-rendered pseudo-3D environments. Players take control of each of the four main characters at different times throughout the game, which enables multilateral perspective on the storyline. Retro Helix mostly plays like survival horror games, relying on a third-person perspective. Similar to the initial entries in the Resident Evil series, the controls are mapped without regard to the character's current position or direction faced. Unlike the original Fear Effect, however, Retro Helix offers players the option of a more traditional control scheme. At the player's disposal is a small arsenal of weapons, including a variety of firearms including pistols, shotguns, and assault rifles, specialty equipment such as a hand-held EMPs and a taser, and one unique melee weapon for each character. In spite of the heavy ordnance available, enemies are few and far between, with static as opposed to dynamic placement. The gameplay is intended to evoke tension and suspense, rather than relying on the nonstop action formula of standard shooters. This format has the consequence of making the gameplay more arguably less difficult, although it is offset by the relative ease at which characters can die from enemy attacks and a number of instant-death scenarios. The fear gauge present in the original game returns for Retro Helix, a variation on the health meter common to most action games.